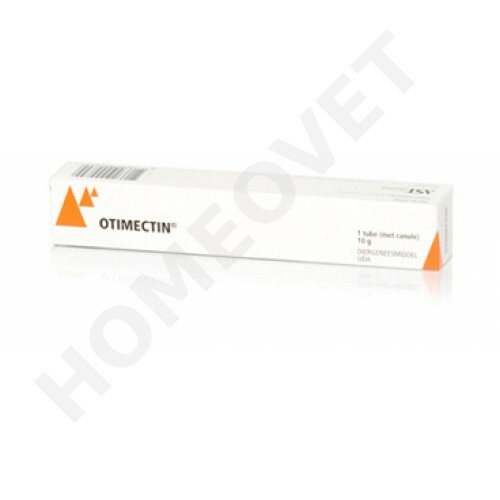 Otimectin In order to combat ear mites (Otodectes cynotis) in cats, it contains the drug ivermectin. Ivermectin belongs to the group of avermectins chemotherapeutic agents that match the structure with the macrolide - antibiotics. Effectiveness is not unique to bacteria and mold. Ivermectin is highly lipophilic (fat loving / fat loving) and therefore almost insoluble in water. Avermectins interfere (overlap, overlap) with the neurotransmitters (biochemical substances heterogeneous) glutamic acid and gamma - aminobutyric acid (GABA) which disturbances in the signal transmission of the nerve may occur (opening of chloride ion channels). This results in paralysis and eventually death of the susceptible Parasite. Do not use for dogs, dogs can be genetically hypersensitive to ivermectin. only for local administration in the ear. The dosage is 1 mg ivermectin per ear. Repeat after 7 and 14 days.